No new polls today. However, all is not lost. The site has an interesting new feature. Starting today, there will be a graph of the electoral college over time from May 24 to the present. The graph is quite surprising. The media keep yelling "It's a tie, it's a tie!" but from looking at the electoral college, a completely different picture emerges. Based on the 231 state polls reported on this site since May 24, we see that Kerry took the lead from Bush on May 25 and held it until mid-June. After two weeks of back-and-forth, Kerry regained the lead on July 2 and has held it solidly ever since. 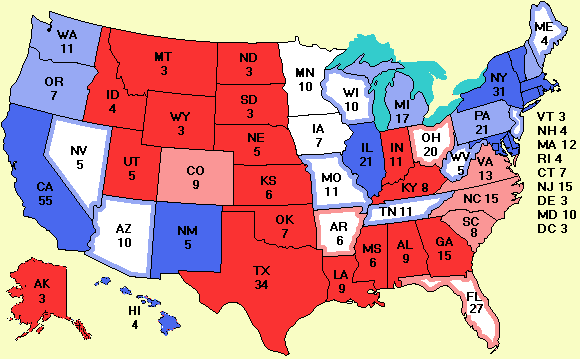 As far as the electoral college goes, it is anything but a tie. This new graph will be permanently located on the More data page although for the time being it will also be on the menu. An article from the Gallup Poll organization discusses a survey they took about what people actually care about and what they base their vote on. Another article , this one by Frank Newport, director of the Gallup Poll, talks about Kerry's acceptance speech in relation to Gallup's polling data. Bob Shrum, who wrote Kerry's acceptance speech, clearly had seen these polls before writing the speech. Both Gallup articles are worth reading. A new version of the excel.zip file has been placed on the site. It contains all the spreadsheets from May 24 through the end of July and supersedes all previous versions, correcting a couple of bugs in the process.